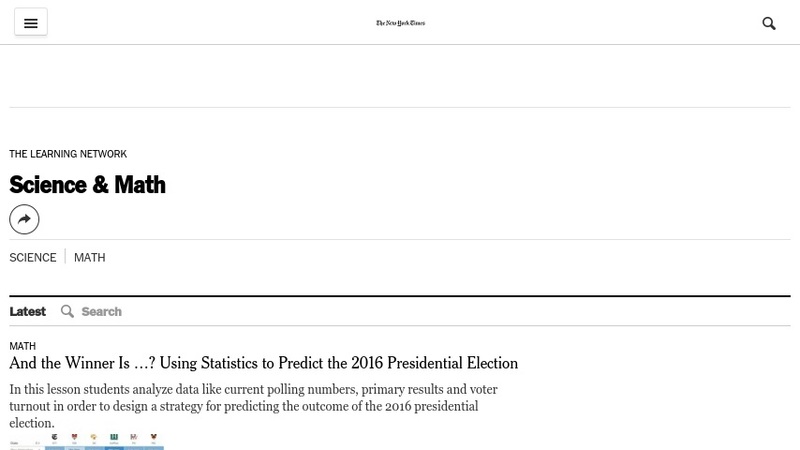 These lesson ideas from the New York Times offer suggestions for ways to draw on real world issues and statistics to develop lessons in mathematics. For example, in one lesson "students convert statistics about gun injuries into visual presentations, then use these as the basis for a poster campaign to teach children about the dangers of guns in home" while another lesson idea involves designing brochures that are intended to explain specific mathematical concepts to a popular audience. Each lesson idea includes a recommended grade level, subject areas covered, lesson objectives, resources/materials needed, a description of the activities along with handouts, further questions for discussion, assessment, key vocabulary terms, and some ways to extend the activities and relate them to other disciplines, such as social studies or journalism. Links to related Times articles and related online resources provide an interactive aspect to each of the lesson entries.